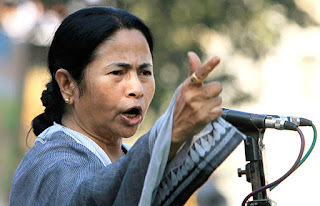 Our Correspondent ● Howrah (Amta) : Virtually beginning campaign for 2016 assembly polls Chief Minister Mamata Banerjee said, if there is an individual getting involved in corruption or scam, this does not mean the party is also indulging thieves. That is individual’s problem. The party cannot be blamed for that, she added. She was addressing an administrative meeting at Amta in Howrah district on Monday (30 November). Banerjee also continued her tirade against Centre and accused it of indifferent attitude towards her demand for adequate financial package to overcome the debt burden left back by the previous Left Front government. She slammed New Delhi for not paying heed to her demand for settlement of devolution of taxes to states and retain subsidies for various development programmes. Strongly criticising the termination or drastic reduction of central funds for several social sector projects like Mid-Day Meal, ICDS, police modernisation, Sarva Shiksha Abhiyan and Jangalmahal development programmes etc, Banerjee demanded immediate restoration of funding of those projects. Accusing the Centre of depriving West Bengal, despite repeated demands, of special financial packages and subsidies for various projects, Banerjee expressed her government’s inability to continue development projects in the state without adequate supply of funds. She said despite financial constraints, her state has acquired self-reliance in power and increased allocation in various projects for the minorities. The Chief Minister’s comment draws sharp criticism from Opposition parties. While CPIM leader Shamik Lahiri described it as the CM’s acceptance to the allegation that Madan Mitra accepted money from Saradha. Now she is trying to distance herself from Mitra and others due to next year’s assembly polls, Lahiri added. Meanwhile, Pradesh Congress President Adhir Ranjan Chowdhury said that the Chief Minister has finally admitted that some of her party members are thieves.